Former President George H.W. Bush in March 2012, when he met with and endorsed Mitt Romney for president. Heaps of private information about the Bush family, including revelations that patriarch and former President George H.W. Bush’s health issues were so dire that his “funeral team” met to discuss details of his service, have been hacked through one of Bush’s daughters. A hacker going by the name “Guccifer” accessed private emails and photos by gaining access to the AOL account of Dorothy Bush Koch, daughter of George H.W. Bush and sister of former President George W. Bush, The Smoking Gun reported. Guccifer then used another online account to post the information, which included self-portrait paintings of George W. Bush showering and bathing and private Bush family photos. In an email exchange with The Smoking Gun, Guccifer said he accessed “interesting emails” about the Bush family, including the health of George H.W. 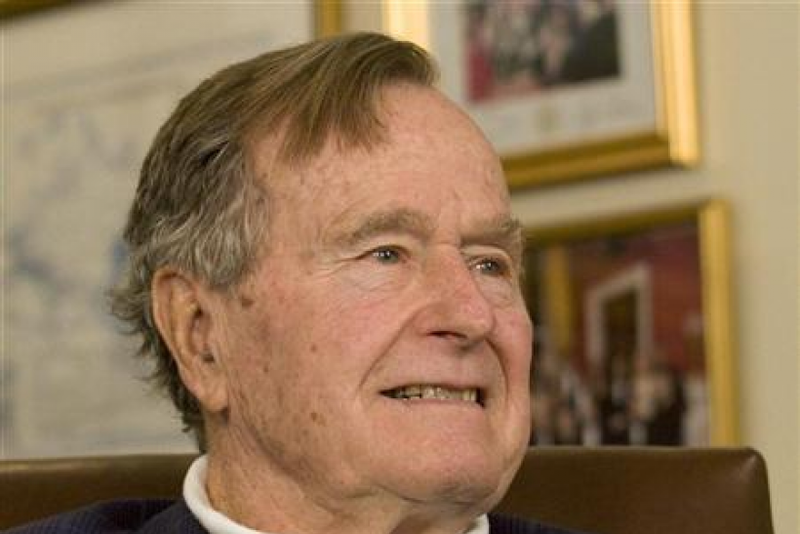 Bush, who was hospitalized last month with pneumonia; some feared the 88-year-old only had days to live. An investigation has been launched into the hacking of the confidential emails and private photos, the Houston Chronicle reported, but the Bush family is not responding to the breach. “We do not comment on matters under criminal investigation," George H.W. Bush spokesman Jim McGrath told the paper. Aside from Koch’s AOL account, Guccifer also gained access to the accounts of close Bush family friends, including CBS sportscaster Jim Nantz. Former first lady Barbara Bush’s brother and her husband’s sister-in-law also had their accounts hacked, according to The Smoking Gun. One of the messages in Koch’s AOL account included a “Report On Dad,” from her brother Neil Bush about the health of her father. George H.W. Bush’s health took a turn for the worse and the former president was in intensive care last month. She added that the message falls “under the broadening category of things NOT TO TELL YOUR MOTHER,” The Smoking Gun reported. George W. Bush wrote in a Dec. 26 email to his brothers and sisters that he was “thinking about eulogy” for his father and asked for stories that he could include for his father’s funeral service. “Hopefully I’m jumping the gun,” he wrote. Besides the messages, a number of private family photos were accessed by Guccifer, including George W. Bush’s paintings, a picture of George H.W. Bush in the hospital and former President Bill Clinton posing with George W. Bush at the Bush family compound in Kennebunkport, Maine. The hacker said he did not fear a federal investigation. “I have an old game with the f------ bastards inside, this is just another chapter in the game,” he wrote.